With an aim to promote a positive image and understanding of technical and vocational education and training (TVET) in the education sector and general community, Dr Rupert Maclean has authored various books and articles for many publications. 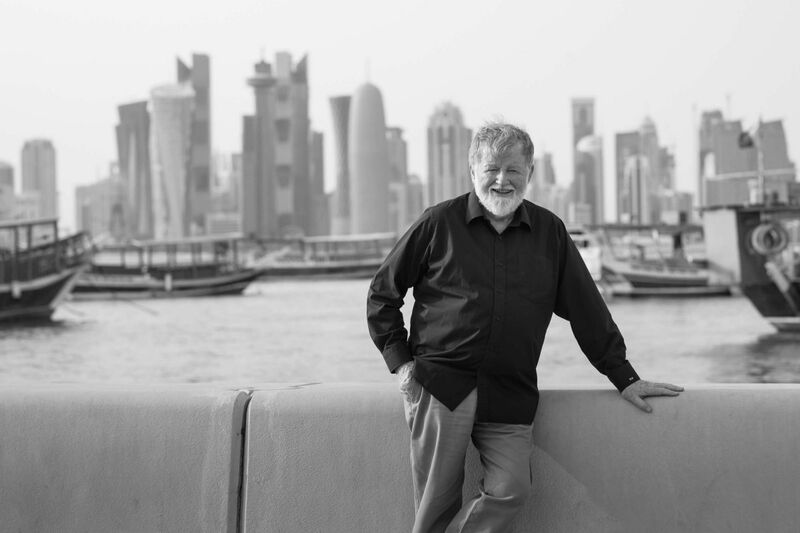 He is currently Foundation QAPCO (Qatar Petrochemical Company) Professional Chair in vocational studies, UNESCO Chair on (TVET), and Co-ordinator of the UNESCO-UNEVOC Centre for Qatar, at the College of the North Atlantic – Qatar. He is concurrently the Honorary Professor, The Education University of Hong Kong; Adjunct Professor, School of Education, RMIT University, Melbourne; and is Visiting Professor, East China Normal University, Shanghai, and at the University of Tun Hussein Onn, Malaysia. Between 2007 and 2015, he was also an Honorary Research Fellow, University of Oxford, Department of Education. 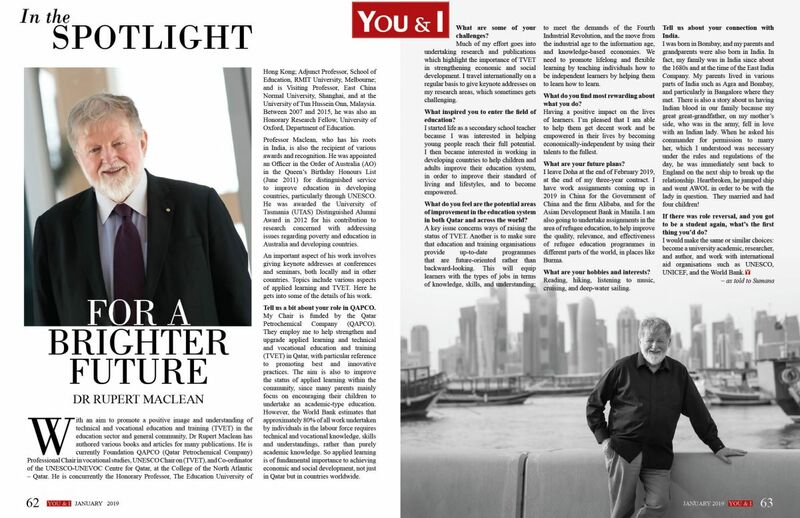 Professor Maclean, who has his roots in India, is also the recipient of various awards and recognition. He was appointed an Officer in the Order of Australia (AO) in the Queen’s Birthday Honours List (June 2011) for distinguished service to improve education in developing countries, particularly through UNESCO. He was awarded the University of Tasmania (UTAS) Distinguished Alumni Award in 2012 for his contribution to research concerned with addressing issues regarding poverty and education in Australia and developing countries. An important aspect of his work involves giving keynote addresses at conferences and seminars, both locally and in other countries. Topics include various aspects of applied learning and TVET. Here he gets into some of the details of his work. Tell us a bit about your role in QAPCO. My Chair is funded by the Qatar Petrochemical Company (QAPCO). They employ me to help strengthen and upgrade applied learning and technical and vocational education and training (TVET) in Qatar, with particular reference to promoting best and innovative practices. The aim is also to improve the status of applied learning within the community, since many parents mainly focus on encouraging their children to undertake an academic-type education. However, the World Bank estimates that approximately 80% of all work undertaken by individuals in the labour force requires technical and vocational knowledge, skills and understandings, rather than purely academic knowledge. So applied learning is of fundamental importance to achieving economic and social development, not just in Qatar but in countries worldwide. Much of my effort goes into undertaking research and publications which highlight the importance of TVET in strengthening economic and social development. I travel internationally on a regular basis to give keynote addresses on my research areas, which sometimes gets challenging. What inspired you to enter the field of education? I started life as a secondary school teacher because I was interested in helping young people reach their full potential. I then became interested in working in developing countries to help children and adults improve their education system, in order to improve their standard of living and lifestyles, and to become empowered. What do you feel are the potential areas of improvement in the education system in both Qatar and across the world? backward-looking. This will equip learners with the types of jobs in terms of knowledge, skills, and understanding; to meet the demands of the Fourth Industrial Revolution, and the move from the industrial age to the information age, and knowledge-based economies. We need to promote lifelong and flexible learning by teaching individuals how to be independent learners by helping them to learn how to learn. Having a positive impact on the lives of learners. I’m pleased that I am able to help them get decent work and be empowered in their lives by becoming economically-independent by using their talents to the fullest. I leave Doha at the end of February 2019, at the end of my three-year contract. I have work assignments coming up in 2019 in China for the Government of China and the firm Alibaba, and for the Asian Development Bank in Manila. I am also going to undertake assignments in the area of refugee education, to help improve the quality, relevance, and effectiveness of refugee education programmes in different parts of the world, in places like Burma. Reading, hiking, listening to music, cruising, and deep-water sailing. Tell us about your connection with India. I was born in Bombay, and my parents and grandparents were also born in India. In fact, my family was in India since about the 1680s and at the time of the East India Company. My parents lived in various parts of India such as Agra and Bombay, and particularly in Bangalore where they met. There is also a story about us having Indian blood in our family because my great great-grandfather, on my mother’s side, who was in the army, fell in love with an Indian lady. When he asked his commander for permission to marry her, which I understood was necessary under the rules and regulations of the day, he was immediately sent back to England on the next ship to break up the relationship. Heartbroken, he jumped ship and went AWOL in order to be with the lady in question. They married and had four children! If there was role reversal, and you got to be a student again, what’s the first thing you’d do?